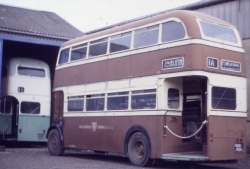 Colchester Corporation ordered ten Roberts bodied Daimler CVD6 buses but took delivery of only five - the others being diverted to other operators. They arrived in the Spring of 1949 and the last one in service, number 4, OHK 432 was withdrawn in 1968. Roberts were an unusual choice of bus body builder - they were more commonly associated with railway vehicles and occasional trams. The body is unusually heavy - weighing about half a ton more than most buses of similar size. This affected the fuel consumption of these vehicles, and may have been a factor in the decision to cancel the second batch of five. 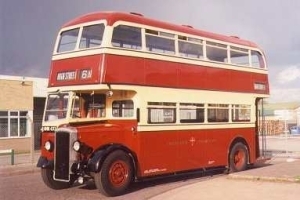 More on the history of Colchester Corporation Transport - including a photograph of identical bus No. 2 can be seen here. By the early seventies, No. 4 had found its way to the Coventry Road Transport Museum where it remained until 1986. That year it was acquired by two members of the Lincolnshire Vintage Vehicle Society. For the next nine years it stood in the rear yard awaiting major electrical work. Although as the years passed it looked increasingly shabby, it was generally in good shape - the metal body had served the bus well. Apart from the electrics, the rear platform had rotted and the inside was in need of considerable refurbishment. A full external repaint was a must. A thorough restoration took place during the late 1990s, and No. 4 returned to the rally circuit in mid 1999. Its restoration also achieved the target date of being available to transport guests at the wedding of the daughter of one of the co-owners in August 1999. During its first year after restoration, number 4 travelled about 1,000 miles to rallies at Sandtoft, Sheffield, Nottingham and Manchester as well as local trips. The programme of work during 2000 included a new complete exhaust and chassis repaint. Thanks to an appeal in Bus and Coach Preservation, Ian Pratt produced a Colchester bus clock that he had purchased from an antique shop in the area some years earlier. This has been fitted and enhances the lower saloon. LEFT - No. 4 prior to restoration. RIGHT- Many Colchester buses carried this advert, including a clock, on the lower saloon bulkhead. "Wind the clock" is an unusual feature of the maintenance schedule for this bus!